Today is the 2nd day of March 2018 and temperatures have dropped around the U.S. since we had that brief preview of spring weather this past week. By the looks of the forecast, that warm weather will not be back for a while, but it is better than the frigid winter we had and hope it does not return the rest of the entire year. Although, currently in the northeast, there are headlines of a Winter Storm Riley going on that is dumping 24″+ of snow in western New York. Today DJ Khaled, Jay-Z, Future and, Beyonce dropped a track titled “Top Off”. Preview it below through the Spotify player. You can also find this track on the newest DJ Mad Lurk product labeled “This Weeks Certified Street Bangers Volume 43” that has just been added to the site. On that release is also Gucci Mane’s newest single with Migos and Lil Yachty labeled “Solitaire”. 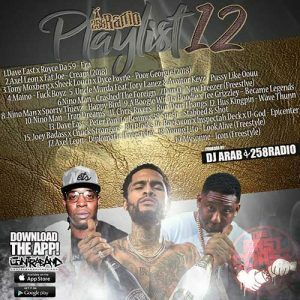 DJ Arab releases another installment of the hip hop collection called “258 Radio Playlist“. 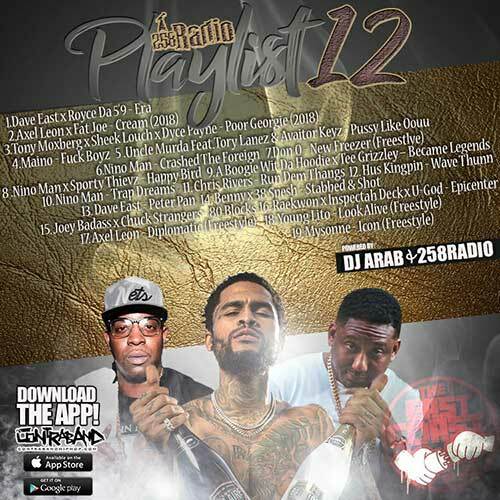 Volume 12 of the series contains tracks by emcees such as Dave East, Royce Da 5’9”, Axel Leon, Fat Joe, Tony Moxberg, Sheek Louch, Dyce Payne, Maino, Uncle Murda, Tory Lanez, Aviator Keyz, Nino Man, Don Q, Sporty Thievez, King Kirk, A Boogie Wit Da Hoodie, Tee Grizzley, Chris Rivers, Hus Kingpin, Benny, 38 Spesh, Joey Bada$$, Chuck Strangers, Raekwon, and many other gutter lyricists. DJ Arab has a whole entire series that contain compilations of the hardest rappers currently out, so be sure to browse through and check them all out. Next up comes a project that contains all the latest hype coming out of the mid-west. 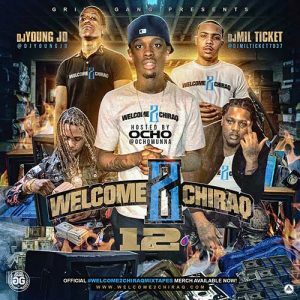 DJs Young JD and Mil Ticket team up to bring the streets part 12 of the “Welcome 2 Chiraq” series. Look for cuts on this drop by G. Herbo, Ocho, Lil Durk, Baby CEO, Fredo Santana, FBG Durk, Lud Foe, FBG Wooski, Hypno Carlito, Memo 600, FBG Cash, 600Breezy, Lil Reese, Rico Recklezz, Chance The Rapper, Lil Uzi Vert, Smoke Da DO, TaySav, Young Famous, and others from the state of Illinois. 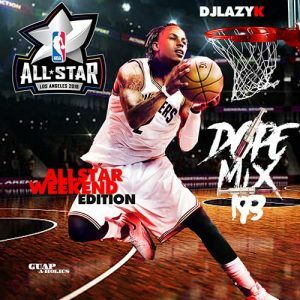 DJ Lazy K returns with another installment in her music catalog titled “Dope Mix”. The 12th installment of the franchise is the “All-Star Weekend Edition” as a tribute to the NBA. This drop gives you a 20-track compilation of her personal favorites in rotation right now with funk by Nipsey Hu$$le, Kendrick Lamar, A-Trak, 2 Chainz, MoneyBagg Yo, Meecho Da Don, Betrayl, Sherwood Marty, Lil Baby, 90’s Babe, Kodak Black, Tory Lanez, Bhad Bhabie, Asian Doll, YBN Nahmir, Rich The Kid, Rick Ross, T-Pain, SZA, and other industry performers. DJ Cinemax and DJ Tom Cruise come together on the 28th edition of the “Trap World” series. 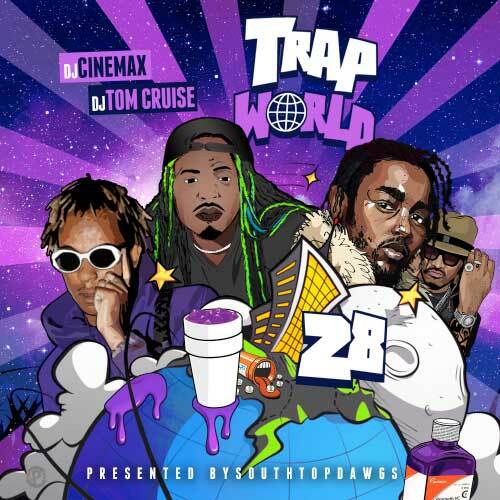 The track listing on this release consists of 24hrs, Jose Guapo, PARTYNEXTDOOR, 10take Wonder, Gulla Gotti, Low Key, Sonny Digital, Kolyon, Molly Brazy, Trina, Joe Gifted, Juice Gang, Lil Cray, Toyko Jetz, Yung Dub D, AD On A Wave, 6ix9ine, Wiz Khalifa, Reese, Denzy, J Hills, Solo Lucci, Rhymez, Smooky Margiela, Shaq, Damar Jackson and much more. This product is presented by South Top Dawgs.